London practice Roberto Di Donato has introduced a pair of wooden storage units to this apartment in Valencia, Spain, to redefine its time-worn interiors. 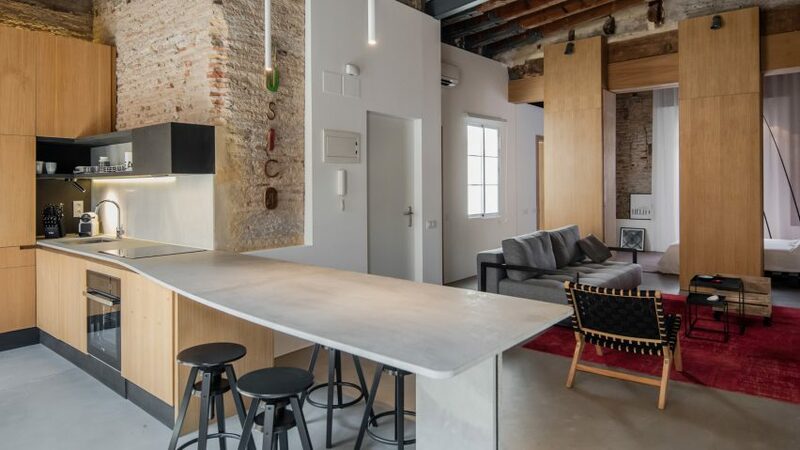 The Musico Iturbi apartment is situated in the La Xerea neighbourhood, set inside a listed residential building that dates back to the early 20th century. Abandoned for several years, it was purchased by a young woman from London who wanted to turn it into a holiday getaway for herself and her friends. She approached Roberto Di Donato to give the apartment's empty shell a contemporary overhaul, requesting that the architects create a series of "distinct, yet fluid" rooms that didn't interfere with the existing structure. 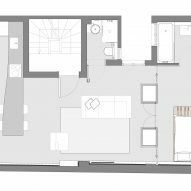 With this in mind, the practice decided to insert two boxy oak wood units to split the apartment into private and gathering areas. They contain a wardrobe and three doors that can be swung open to offer different levels of privacy. "We gave ourselves the challenge of respecting the building as much as possible, preserving and enhancing the character of the existing fabric," founder Roberto Di Donato told Dezeen. "So we opted to introduce non-conventional partition walls, making the entire depth of the space visible and interconnected." On one side of the units lies the living the room, which is dressed with a large grey sofa and textured red rug. 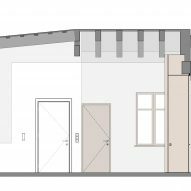 The kitchen has been completed with timber cabinetry, and a dining area with a long breakfast counter intended to emphasise the width of the apartment. This is heightened by a bright white strip of plasterboard that runs the length of the entire space. 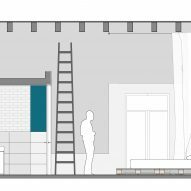 The bedroom sits on the other side of the storage volumes, and has been finished with sheer full-height curtains, tall floor lamps and a black ladder to draw attention to the building's lofty ceilings. Other than the roof, which the architects restored, the rest of the apartment has largely been left untouched – cracks, old patches of plaster, and crumbling bricks are visible across all of the walls. "By only adding essential new features, 'wounds' and layers of transformations over the years were carefully retained and displayed to enhance the sense of continuity with the building's history," said the practice. Belgian studio Fragmenture also used storage to rearrange a house in Ghent, incorporating a wedge-shaped volume into its kitchen. Walls with built in cabinetry also helped US practice MOS Architects define the rooms of an art collector's apartment in New York.